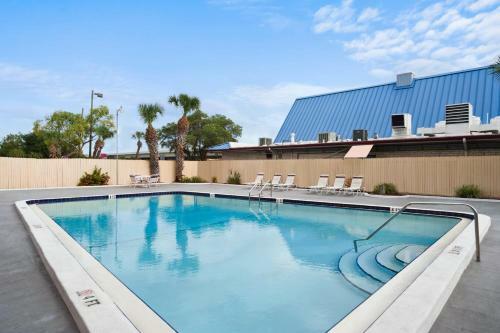 In-house dining free Wi-Fi and an outdoor pool and hot tub keep our guests booked at the pet-friendly Clarion Inn & Suites Clearwater. All 140 rooms on two floors at the Clarion Inn have free Wi-Fi and flat-panel cable TVs as well as microwaves refrigerators and coffeemakers. Rooms are accessed from exterior corridors and non-smoking rooms are available. Complimentary breakfast is served each morning and you can grab a meal from the on-site grill or unwind over a cold drink while watching televised sports at its bar. Guests can catch up on work at the business center or exercise in the fitness room. The property has an outdoor pool area with a hot tub and children's pool. A laundry facility adds convenience. Pets are welcome. Parking is free. 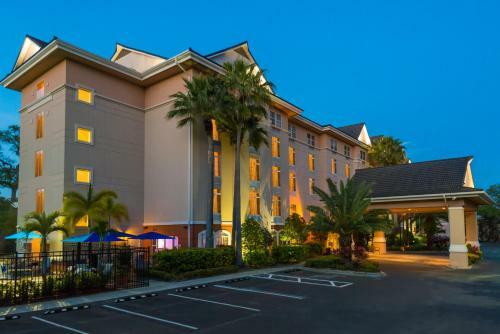 The Clarion Inn is off U.S. 19 five-and-a-half miles east of downtown Clearwater and seven miles from Clearwater Beach. Tampa is a half-hour away by car. There are numerous restaurants within one mile and Clearwater Mall one-and-a-half miles south has dozens of shops. Bright House Field home of minor-league baseball team the Clearwater Threshers is less than one mile north. Saint Petersburg-Clearwater International Airport is seven miles south.